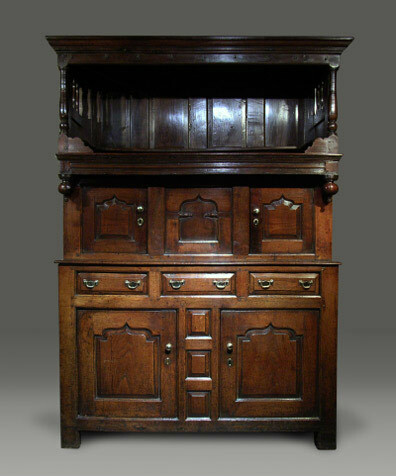 Beautiful example of a Welsh oak cwpwrdd tridarn, from Snowdonia circa 1730. In the top tier it has the sought-after feature of wavy-slats above panelled sides. On either side of the front, there is a well-turned column ending in a shaped front-facing shaped shoe. The front rail of the top section is heavily moulded ending at both sides in bold turned drop-pendants. The middle section consists of two outside cupboard doors which have well proportioned raised and fielded gothic panels either side of a fixed panel with an ogee-shaped panel dissected by split-turnings. The base section has a row of three slim drawers with raised and fielded panels above two cupboard doors, each with elongated gothic shaped raised and fielded panels. At the centre of the base there are three vertical raised and fielded panels, with the whole is supported on four stile feet.